The PosiCharge™ SVS are premium intelligent fast chargers designed to handle multiple shifts for round-the-clock performance for the hardest working forklifts in the fleet. Looking for GSE Chargers? Switch to the eGSE Product Selector. Not sure which charging solution is right for you? If you are building a new facility, converting to electric fleet, or experiencing losses due to battery changing operation, contact us - we’re here to help. 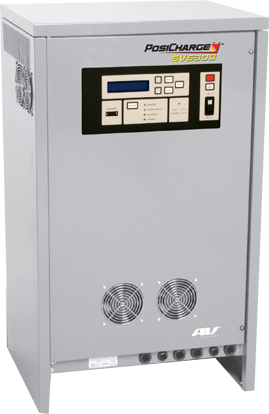 Delivering up to 500 Amps, the PosiCharge SVS300 is a heavy duty charger designed for the toughest applications. The SVS300 incorporates efficient and reliable IGBT electronics to safely and efficiently charge vehicles in demanding operations from automotive manufacturing to food & beverage distribution, among others. A cost-effective stand-alone solution that combines exceptional output capability with compact size, the SVS300 can be mounted virtually anywhere, keeping operations performing with maximum productivity. And like all PosiCharge chargers, the SVS300 works with a broad range of battery voltages and has the same data management and on-board intelligence. Options include, automatic watering, PosiNet, Battery Rx, dynamic EQ scheduler, electrolyte immersed thermistor, and modular cable system.